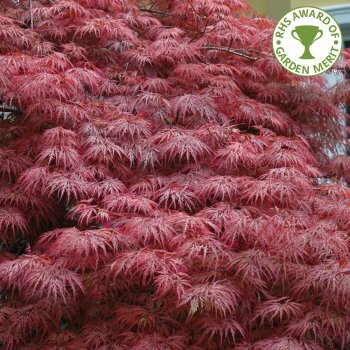 Acer palmatum dissectum 'Garnet' has feathery, heavily dissected foliage that resembles the colour of a garnet stone throughout the spring and summer. It holds its colour well compared to other Japanese Maples, before turning shades of scarlet for a striking display in Autumn. 'Garnet' is a very popular variety of Japanese Maple tree so we have a range of sizes, grown either as a mound forming bush or with a clear stem, top grafted at either 90cm or 130cm. The larger specimens have been grown over many years into a lovely tiered shape and will create a stunning feature. Pot grown 'Garnet' Japanese Maples can be planted at any time of the year. Firstly, remove all weeds and grass within a metre of your desired planting hole then dig a square hole as deep as your root mass and approximately 2x as wide. To help your tree establish more effectively, we advise sprinkling root grow in the hole, especially if you have poor soil. When planting Japanese Acers, use ericaceous compost when possible as this encourages vibrant foliage colour. Using 50% of the original soil and 50% compost, fill in the hole and firm around gently. Make sure not to bank the soil up around the collar of the tree as this can cause problems.